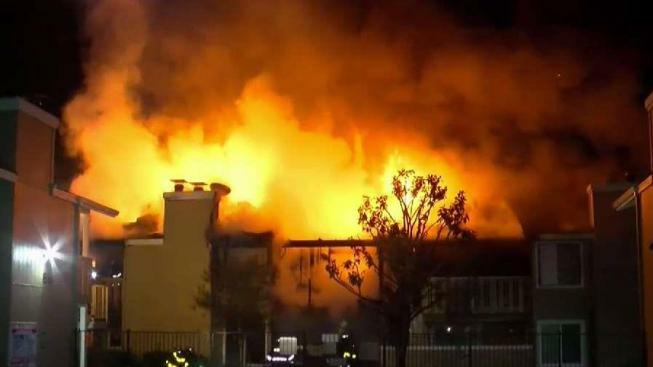 A fire ripped through a San Jose apartment complex early Friday, leaving more than a dozen people without homes. Bob Redell reports. A fire ripped through a San Jose apartment complex early Friday, leaving more than a dozen people homeless. Crews responded to 95 Rancho Drive on a report of a structure fire around 12:30 a.m. to find a two-story, eight-unit building ablaze. Responding firefighters said the flames had spread to both floors, forcing them to immediately go into rescue mode to ensure the safety of all the inhabitants. Crews called for a second, and then eventually a third alarm. It took them about an hour to knock down the blaze. The fire department doesn’t know yet what caused this fire, but confirmed that it sparked in one of the units on the left side of the building. Sixteen people, including five children, are now going to have to find a new place to live. Their homes are either destroyed or damaged to the point of being uninhabitable. The Red Cross was at the scene overnight, helping the displaced residents with hotel rooms and blankets.